This is a classic, simple, Greek peasant (!) dish that has remained popular for good reason. 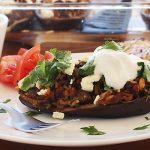 Healthy, filling, easy to make… and makes great leftovers! Go to any Greek taverna, definitely in Greece but quite possibly throughout the world as well, and you’ll find stuffed peppers and tomatoes on the menu. Go to any Greek household, and you’ll find a recipe for them – most likely passed down from generation to generation. It’s one of those staple meals that everyone knows and loves, like spag bol or macaroni and cheese. And just in case you’re someone who enjoys knowing the full background of ethnic foods, in Greece this dish is called ‘Gemista’ (pronounced ‘YEmist-A’), meaning ‘stuffed’. It’s one of a group of very traditional ‘peasant’ foods called ‘ladera’ (pronounced ‘lather-A’), which comes from the Greek word for oil (olive oil, of course). I’d also dare to say that there are as many versions of this recipe as there are restaurants and households in Greece. Everyone has their own favourite way of making it. Some don’t bother with a tomato sauce to spoon over the top (not advised, in my opinion! ), many many versions are vegetarian following the ‘ladera’ tradition (generally very tasty), and still others contain a few raisins and pine nuts (those are the versions influenced by Greece’s former links with Asia Minor, otherwise known as modern-day Turkey). 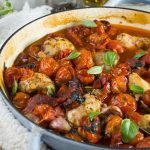 I think a few raisins and pine nuts lift this dish to a whole new level – in a very good way – but today I’ve kept things on the simple side and made an everyday version containing a bit of meat and plenty of delicious tomato sauce for spooning over. If you’d rather skip the meat, just skip it. No big deal. Follow the recipe below, but miss out the meat. Add a few extra veggies if you like. Simple. Now I wouldn’t say this is the fastest meal to get on the table, due to the scooping out of the tomatoes and the longish cooking time (an hour and a quarter), but it’s still very easy. And I bet you’ll feel a great sense of achievement when it’s done and it tastes so deliciously healthy, and authentically Mediterranean. This recipe also makes quite a lot, so you might find there’s enough for a work lunch the next day, or to pop in the freezer. 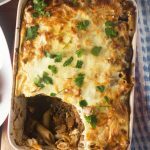 It keeps well for a good few days in the fridge and re-heats well, although you can even try it at room temperature or straight from the fridge! Scoop flesh out of tomatoes and dump into food processor with tomato puree, garlic, olive oil and water (this will be your sauce for pouring over during cooking). Scoop seeds and ‘bits’ out of peppers. Stand hollowed-out tomatoes and peppers in a big baking pan. Make a simple filling of veggies, canned tomatoes, ground beef (if you like), rice and herbs. Stuff veggies with filling. Poke potato wedges into the spaces between the stuffed veggies. Pour reserved tomato sauce over the top, along with a generous amount of water, then bake. 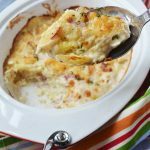 Serve with a big wedge of feta cheese. 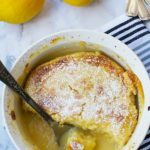 You see – there are quite a few steps, but it’s super easy, and there aren’t actually all that many main ingredients, if you exclude things like oil, seasoning and herbs. I struggled to find big beefsteak tomatoes near where I live. The supermarket literally had two left (two! ), but if you have the same problem, never fear! I found out that slightly smaller ones work just as well. Just find the biggest ones you can, and use a few more than stated in the recipe. What takes this rather simple dish (peasant food, remember!) 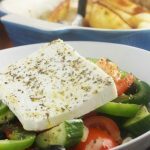 from good to excellent is the gorgeous tomato sauce spooned over the top of the vegetables, and the big wedge of feta that you serve on the side. I’m very greedy with the feta as I like to eat a little bit with every mouthful. Make sure you buy plenty so you can try this too! If you give this meal a try some time, I’d love it if you’d let me know what you thought in the comments below! P.S. Update: I totally forgot to tell you this all-important little tip. You’ll find there’s actually too much rice filling. Freeze this for next time! Simply make up some more tomato sauce using canned tomatoes instead of scooped-out tomato – and you’re good to go! 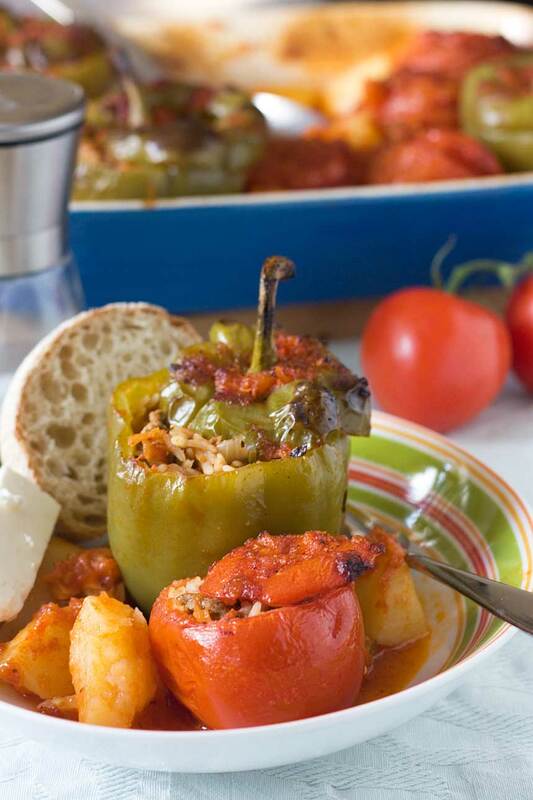 These stuffed peppers and tomatoes are a staple meal in Greek households. Almost every home has its own recipe. 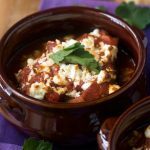 They're so delicious with the tomato sauce spooned over the top and a big wedge of feta cheese. Mmmm! Slice the top of the tomatoes off (keeping each top close to its corresponding tomato), then scoop the flesh out of them using a teaspoon. Leave enough around the edge so that the tomato ‘shell’ stays intact. Put the flesh straight into a food processor* and add the 6 tablespoons olive oil, 2 tablespoons tomato puree, garlic, sugar, salt and pepper. Whizz to combine and make a sauce. Now slice the tops off the peppers (keeping the tops close by) and scoop out the pith and seeds. Finish by rinsing the insides under the tap, then arrange the empty peppers and tomatoes in a large baking dish (keeping the tops close by). Now pre-heat the oven to 200C / 390F. Heat up a big drizzle of olive oil in a large saucepan and add the onions, red bell pepper (or zucchini), and carrot. Cook and stir for a few minutes until softened, then add the beef. Cook again, stirring, for another few minutes until the meat has browned. Add the rice, canned tomatoes, 2 tablespoons tomato puree and about 180 ml / ¾ of a cup of water**, combine well, then cover and leave to simmer on a low-ish heat for about 10 minutes, until the rice is partly cooked. Stir through the parsley and mint, and plenty of salt and pepper. 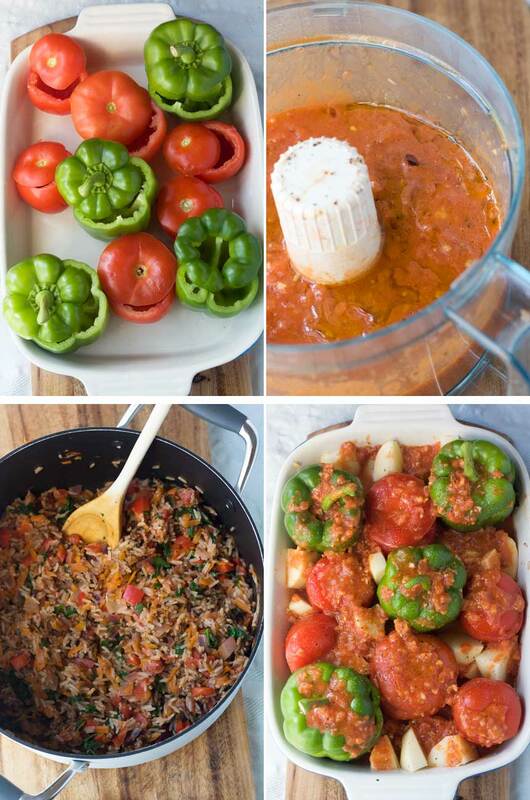 Use the rice and meat filling to stuff the tomatoes and peppers until about ¾ full***, then cover with the veggie tops. Poke the potato wedges in between the veggies. Pour the tomato sauce that you made in the food processor all over the tomatoes and peppers and potatoes, along with 250 ml (1 cup) water. Cover the baking dish with aluminium foil and bake for 1¼ hours, removing the foil half way through cooking. Serve a tomato and a pepper for each person, spooning some of the tomato sauce over. Serve with a wedge of feta and crusty bread. You'll notice that you have far too much rice filling! Freeze it for next time! Simply make some more potato sauce using canned tomatoes instead of scooped-out tomato! 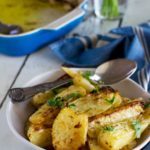 Don’t make the potato wedges too big because you want them to be properly tender by the time the vegetables are baked. *If you don’t have a food processor, it’s fine to just combine the ingredients in a bowl. The sauce will just be a bit chunkier, that’s all. **You need enough liquid for the rice to cook. ***The rice will continue to cook and expand in the oven! You can serve the stuffed vegetables hot, warm, or at room temperature. Delicious any of these ways! 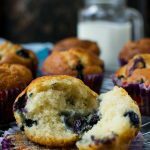 Would you like to follow me on Pinterest, too? I’m always pinning tasty food! Totally agreed! I especially love eating the tomatoes! Fabulous meatless Monday Recipe! I love the sauce. Great comfort food as the days grow cooler. Sharing everywhere! Hello Bam! Thank you so much for the shares! 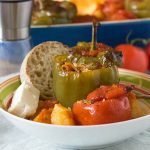 There is something so good about a stuffed pepper and I have my usual recipe I make but I think it’s time to shake things up with your recipe. I’m loving all the flavors going on. Thanks, Janette – hope you enjoy this as much I as do! These look fantastic! And we make similar ones in Bulgaria 🙂 Love your Greek recipes Helen! Pinned! I love stuffed peppers and tomatoes, haven’t had them ages, great reminder. Yours look delicious! Thanks, Anna! 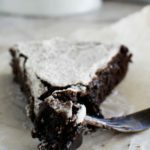 I hadn’t made these for ages either, but they’re SO worth the effort! Your timing is perfect, Helen! My friend just e-mailed me saying that she got a whole bag of bell peppers in her CSA share and was asking me what to do with them. Holy moly! THIS is the answer. 🙂 These look fantastic. Well of course I had a sixth sense about that, Marissa, and posted this just for you!! Thank you, Lorraine! It is indeed versatile – you can add whatever veggies you like to the rice, skip the meat, add other goodies etc. … perfect! I DID miss it on SnapChat, Nagi 🙁 but that sounds wonderful. I actually think smaller capsicums would work better! Ta cuisine inspiré dans le méditerranée est toujours plein de couleur ! J’aurais tellement aimée gouter ce plat pour mon diner ce soir et me transporté en Greece ! 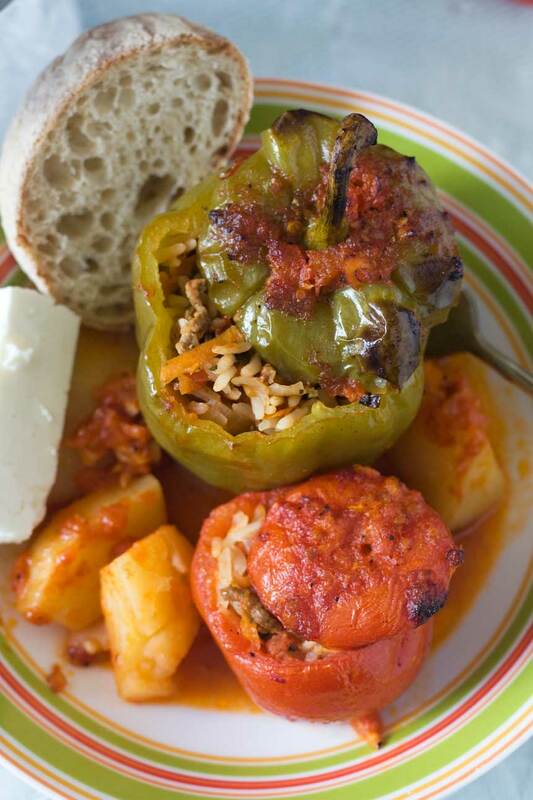 Have not yet tried this recipe, but grew up n stuffed peppers, and have made versions of my own . Kids love them, and why not 🙂 delish. Oh and first time I went to the Philippines and made these, my girlfriend’s Mom was caught hiding a couple in the back of the refrigerator for later hehehe. You know what? I’m thinking if you take a small can of black beans and put in with your meat and rice, this would take this meal over the top. Love to hear thoughts on this?? I don’t see why not, Steve. Give it a go!